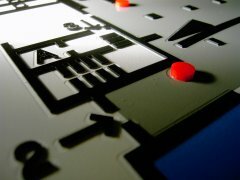 Tactile orientation aids, barrier free (accessible) according to DIN 18024. Tactile guidance systems are becoming more relevant as the demands for "barrier-free construction" grow. We are ready to meet tomorrow's challenges. Tactile lettertypes are part of a system that benefits visually impaired visitors so that they have increased mobility in public buildings and hospitals, for example. High-contrast representations and font sizes must be easily felt. The pyramid-like representation of the individual letters and numbers ensures this.